Located at the rear of the Student Building, the Collaborative Learning Studio (SB 015) is an innovative classroom space that leverages advanced technologies to support collaborative learning in large classes. Students can work as teams at technology-enhanced tables and have their work displayed on a 20-foot wide video wall for sharing with the larger class. The Studio was designed to offer an alternative to the traditional lecture hall, facilitating active learning approaches that include team-based learning, problem-based learning, and other collaborative pedagogies. Without a traditional instructor lectern, or even a clear “front” to the room, the Studio has a de-centered feel, allowing the instructor to provide short bits of instruction from anywhere in the room, interspersed with student-based learning activities that call on students to apply course concepts to solve challenging problems and engage in other hands-on collaborative projects. The room contains 16 six-student tables (total seating for 96 students). Each table contains a computer, large monitor, connections for three laptops, and two push-to-talk microphones. Document cameras and speakers are available for use at the student tables if activities require these technologies. The tables are large enough for students to work actively on projects, either as a six-person team or two smaller 3-person teams. Portable white boards allow students to sketch out solutions to problems posed as part of learning activities. 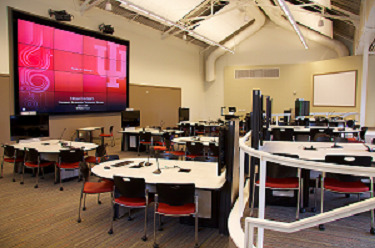 A 20-foot wide video wall allows instructors to display multiple types of content, including standard instructor tools (computer, document camera, DVD player) as well as the screens of individual student tables. Made up of sixteen monitors, the wall can accommodate a “gallery view” of all sixteen student table computers, a “quad view” combination of four sources (tables and/or instructor tools), or one large image. In addition to the video wall, content can be projected on two large screens at the sides of the room, as well as to the monitors at each table. These advanced projection options allow for the sharing and discussion of student work, as well as for display of multiple pieces of content needed for table-based activities. Agreement to attend a course development workshop (a combination of technical orientation and active-learning pedagogy workshop) and/or work with a CITL consultant on the design of active learning strategies that best utilize the room’s capabilities; applicants with prior experience teaching in these rooms are asked to participate in order to share their experiences. In the case of scheduling conflicts, priority will be given to courses that provide clear plans for utilizing the space and its technology in support of active learning. The Center for Innovative Teaching and Learning will announce this application process each semester to department chairs, indicating a deadline for requests. The CITL will send a list of recommended courses to the Registrar’s office, which will schedule the classes into the room. CITL consultants, in conjunction with Classroom Technology Services, will provide training and support for instructors using these spaces, including helping instructors redesign their courses to include active learning, providing training on the room’s technology, and forming communities of instructors who want to share experiences about teaching in this space. Queries about this process can be addressed to CITL.